The west side of the South Bay and Peninsula is a fun place to paddle with lots of wildlife reserves as well as marinas for landing. 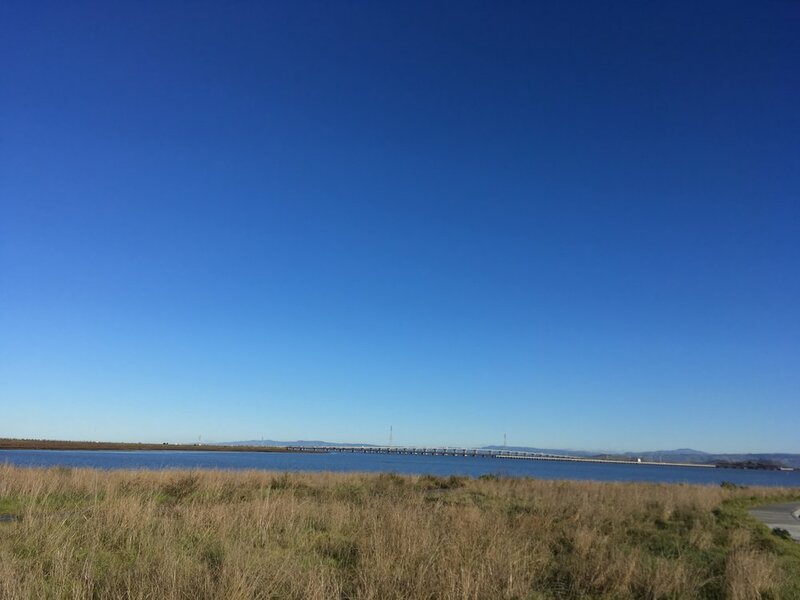 After crossing the Dumbarton bridge, a panoramic view of the south bay and east bay is fantastic. On a clear day, you can see all of the peninsula, Marin headlands, Mount Tam, San Francisco, Emeryville, Oakland, Mount Diablo and the rest of east bay. It's so panoramic it looks like a wide-angle go-pro shot. Click below picture to see an expanded map. On January 5th, 2017, I tried to put on early but I spaced out and left my paddle in the lyft car that brought me to Cooley Landing. So I had to wait another hour until my driver dropped off the paddle, thankfully! By then the wind had kicked up a little bit and the tide was going out. So another mud wading for me. It was very shallow even a mile away from shore and I quickly developed a paddling stroke using the mud. As I paddled towards Redwood City, a good landmark are the blue buildings occupied by Bio Tech firms in Redwood City. There's a small opening before the main channel into Redwood City just around Greco Island, but you can also just paddle on and turn west. Lots of birds life as usual along the coast. Put-in: Cooley Landing is a beautiful place on the bay. There's an orange wooden building that's dedicated for the East Palo Alto environmental education. The orange color is a great landmark. There are two parking lots and a porti-pottie as well. Kayaks and SUPs can land on the south side of the point, there's a small trail leading to the parking lot. If you can go to the south side, scrambling up the rocks by the point is also an option but be very careful. Some of the rocks have steel rebars, it wouldn't be fun falling onto one of those. Low tide is of course a problem there as well, anything less than 3-4 feet will present you with a long push off in the mud. Alternatively you can also land in the Baylands Nature Reserve. There's a large dock, water spigot and porta potty there and plenty of parking. It's a mile from Cooley Landing and just north of Hook's Point. The Palo Alto Airport is a good landmark for that take-out. My friend Gary Leong told me that some years ago some idiot engineers from Tesla tried to take off from the airport during heavy fog and flew into the power lines along the coast. But fortunately for paddlers, we can follow the power lines during fog and be able to spot the coast. Take-out: Redwood City has multiple marinas, but some of them are private and will absolutely refuse small boaters to put-in and take out. The public ramp situated next to the Stanford Sailing and Rowing Center is the quickest access to the water. I find that the south end of the center with the small boats is best for SUPs (see below picture).